We can glean many lessons from the most recent college admissions scandal. A system that purports to be merit-based really isn’t. Standardized testing can be gamed. A few elite universities hold enormous sway in the American imagination. Hard work matters less than the ability to write a big check. The wealthy will do anything to preserve the privilege of plutocracy. We knew all that, though. What struck me most about the admissions scandal was how blatantly transactional a college degree has become and how vulnerable universities have become to sacrificing their integrity to the promise of a bigger donation. I’ve written before about how the product of education – a diploma, an overemphasis on sports, bucolic images of campuses, perceptions of privilege from association with a particular institution – have overshadowed the process of learning. The admissions scandal not only reinforces that idea of education as a product but makes it clear that to many, education is only a product. Those of us who teach see that mentality all too often in our classes. An undergraduate once told me that I was diminishing her prospects because she had to work too hard to earn an A. She knew what she wanted to do, she said, and she would learn nothing from my class or the other classes she was required to take. A degree with a high GPA was the only important thing, she said. Another student quoted his father as saying that the only thing college was good for was to meet people who could help you later. Those students represent extremes of what higher education has become. College costs loom so large that students choose majors based on how much money they can make rather than on what might fulfill them in career. State governments perpetuate this by channeling money to favored programs rather than to universities as a whole, emphasizing economic development over an informed citizenry. The federal government encourages it by favoring privately issued college loans over grants and highlighting graduates’ income in comparing college programs. And universities themselves perpetuate it by chasing the status of rankings and promoting prestige over the needs of student learners. Universities must live within this transactional culture but they must not sacrifice their integrity. They must address student concerns about costs and careers and salaries. They must make classes more accessible and convenient to students (see below). They must find fairer ways than standardized tests to gauge student competency. Above all, they must promote the process rather than the product of education. A college education is certainly about career preparation, and institutions must help guide anxious students toward meaningful careers. They must also remind students that education is about learning and discovery. It’s about challenging ideas and beliefs, about challenging the self. It’s about a wide range of values and intellectual challenges that must be lived and earned, not bought and sold. 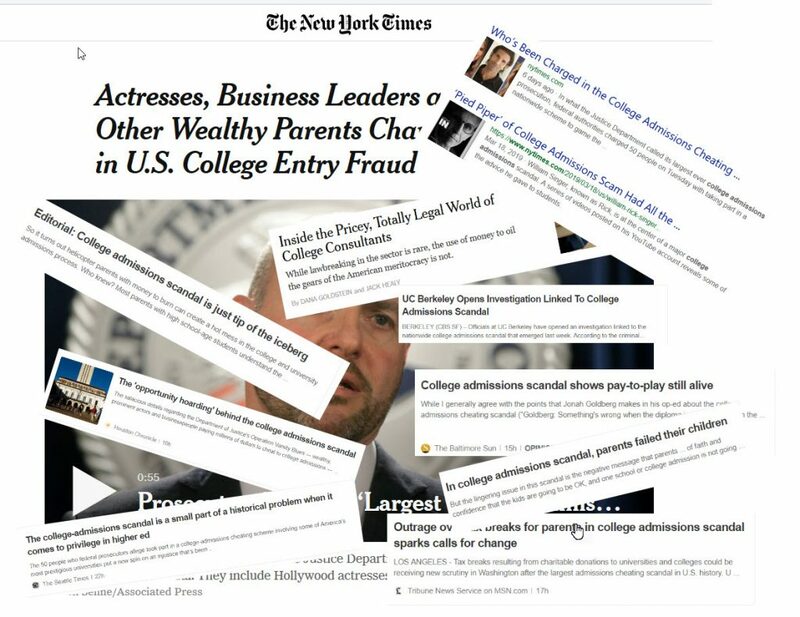 If nothing else, the admissions scandal should push universities to take a hard look at themselves and ask what they value, how they are perceived, and how they can maintain their integrity. If they don’t, they risk becoming just a wall decoration in a tarnished gilded frame. MOOC-mania has largely subsided, but companies and non-profit organizations continue to experiment with models that allow students to take online courses at little or no cost and transfer the credits to traditional colleges and universities. EducationNext writes about three of those entities – StraighterLine, Modern States, and Global Freshman Academy – which collectively have enrolled more than 500,000 students but have mostly had the same low completion rates as MOOCs. For instance, Arizona State created Global Freshman Academy in 2015. That program allows students to take 14 online freshman-level courses for $600 each. Of 373,000 who have enrolled, only 1,750 have completed. Students who have enrolled in classes through StraighterLine and Modern States generally complete only a course or two. Those are hardly stunning results, but they are nonetheless worth watching. Many students are already acquiring college credit through advanced placement exams and dual-enrollment courses, which are generally taught on college campuses. KU is also expanding the number of classes it offers through Lawrence Public Schools, with courses created by KU instructors but taught by high school teachers. Students will pay a lower rate for those courses. The Edwards Campus has taken this even further, working with area high schools and community colleges so that students can earn a college degree in three years. Take a trip on the K-10 bus between Lawrence and Johnson County Community College, and you will see substantial numbers of KU students traveling to classes at JCCC. Many others take online community college classes in the summer, not only because of the convenience but because of the lower cost. Some university classes incorporate MOOCs in their instruction, supplementing the online materials with in-class discussions and problem-solving. The upshot of all this is that a college education is not always centered on a single institution. Most universities treat it that way, but students are increasingly considering cost and convienience. And as long as the cost of a college education pushes large numbers of students into debt and the demand for flexibility in scheduling and class format grows, there will be opportunities for outside organizations to step in with alternative approaches to higher education. Those of us in higher education know all too well that states have slashed funding for colleges and universities over the last 10 years. Yes, “slashed” is the right work. The Center on Budget and Policy Priorities says that states’ spending on higher education is $9 billion lower today than it was in 2008, after adjusting for inflation. That message apparently hasn’t gotten through to the American public, though. According to a poll conducted by APM Research Lab and the Hechinger Report, 34% of Americans think funding for higher education has stayed the same over the last 10 years, and 27 percent think it has increased. (We wish.) Only 29 percent realize that funding has actually declined. More people realize that government-financed grants and loans have not kept up with tuition increases. In the APM-Hechinger poll, 44 percent said they knew that. Disturbingly, though, about the same percentage said they thought that government aid had either increased or stayed the same. The poll showed some interesting disparities among various groups. I won’t go into those other than to say that Easterners seem better informed than Westerners and Democrats better informed than Republicans. The abysmal overall understanding, though, should send a clear message to those of us who work in higher education: We need to do a better job of communicating with the public. Doug Ward is the acting director of the Center for Teaching Excellence and an associate professor of journalism. You can follow him on Twitter @kuediting. It’s that “but” that about 30 faculty members from four research universities focused on at a mini-conference here this week. All are part of a project called TEval, which is working to develop a richer model of teaching evaluation by helping departments change their teaching culture. The project, funded by a $2.8 million National Science Foundation grant, involves faculty members from KU, Colorado, Massachusetts, and Michigan State. 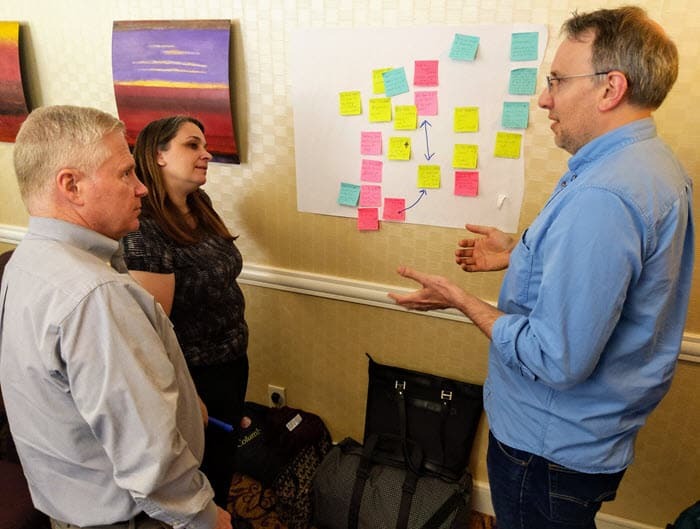 Rob Ward, Tracey LaPierre and Chris Fischer discuss strategies during a meeting of TEval, an NSF-grant-funded project for changing the way teaching is evaluated. They joined colleagues from three other universities for meetings this week in Charlotte, N.C. The TEval project is working with partner departments to revamp that entrenched process. Doing so, though, requires additional time, work and thought. It requires instructors to document the important elements of their teaching – elements that have often been taken for granted — to reflect on that work in meaningful ways, and to produce a plan for improvement. It requires evaluation committees to invest time in learning about instructors, courses and curricula, and to work through portfolios rather than reducing teaching to a single number and a single class visit, a process that tends to clump everyone together into a meaningless above-average heap. That’s the where the “but …” comes into play. Teaching has long been a second-class citizen in the rewards system of research universities, leading many instructors and administrators to chafe at the idea of spending more time documenting and evaluating teaching. As with so many aspects of university life, though, real change can come about only if we are willing to put in the time and effort to make it happen. None of this is easy. At all the campuses involved in the TEval project, though, instructors and department leaders have agreed to make the time. The goal is to refine the evaluation process, share trials and experiences, create a palette of best practices, and find pathways that others can follow. University policies that fail to reward teaching, innovation, or efforts to change culture. An evaluation system based on volume: number of students taught, numbers on student surveys, number of teaching awards. Recalcitrant faculty who resist changing a system that has long rewarded selfishness and who show no interest in reframing teaching as a shared endeavor. Administrators who refuse to give faculty the time they need to engage in a more effective evaluation system. Tension between treating evaluations as formative (a means of improving teaching) and evaluative (a means of determining merit raises and promotions). Agreeing on what constitutes evidence of high-quality teaching. Tapping into the desire that most faculty have for seeing their students succeed. Working with small groups to build momentum in many departments. Creating a flexible system that can apply to many circumstances and can accommodate many types of evidence. This is especially important amid rapidly changing demands on and expectations for colleges and universities. Helping faculty members demonstrate the success of evidence-based practices even when students resist. Allowing truly innovative and highly effective instructors to stand out and allowing departments to focus on the types of skills they need instructors to have in different types of classes. Allowing instructors, departments and universities to tell a richer, more compelling story about the value of teaching and learning. Those involved were realistic, though. They recognized that they have much work ahead as they make small changes they hope will lead to more significant cultural changes. They recognized the value of a network of colleagues willing to share ideas, to offer support and resources, and to share the burden of a daunting task. And they recognized that they are on the forefront of a long-needed revolution in the way teaching is evaluated and valued at research universities. At KU, the project for creating a richer system for evaluating teaching is known as Benchmarks for Teaching Effectiveness. Nine departments are now involved in the project: African and African-American Studies; Biology; Chemical and Petroleum Engineering; French, Francophone and Italian; Linguistics; Philosophy; Physics; Public Affairs and Administration; and Sociology. Representatives from those departments who attended the Charlotte meeting were Chris Fischer, Bruce Hayes, Tracey LaPierre, Ward Lyles, and Rob Ward. The leaders of the KU project, Andrea Greenhoot, Meagan Patterson and Doug Ward, also attended. Tom Deans, an English professor at the University of Connecticut, challenges faculty to reduce the length of their syllabuses, saying that “the typical syllabus has now become a too-long list of policies, learning outcomes, grading formulas, defensive maneuvers, recommendations, cautions, and referrals.” He says a syllabus should be no more than two pages. … British universities are receiving record numbers of applications from students from China and Hong Kong, The Guardian reports. In the U.S., applications from Chinese students have held steady, but fewer international students are applying to U.S. universities, the Council of Graduate Studies reports. … As the popularity of computer science has grown, students at many universities are having trouble getting the classes they need, The New York Times reports. Education has always been a balancing act. In our classes, we constantly choose what concepts to emphasize, what content to cover, what ideas to discuss, and what skills to practice. As I wrote last week, the choices we make will influence our students throughout their careers. Higher education is now facing a different kind of balancing act, though, one that involves not just what we teach and who we are but what college is and should be about and how it fits into the broader fabric of society. The recent annual meeting of the Association of American Colleges and Universities made clear just how tenuous a grasp higher education has on credibility and how broad the gap is between internal and external perceptions of colleges and universities. Lest those of you in professional programs start to feel smug, read on. In Gallup polling, Busteed said, Americans express confidence in “higher education” and “post-secondary education.” They see those things as important to the future. When asked about “college” or “university,” though, the warm feelings suddenly chill. In other words, Americans see a need for education to prepare them for jobs and careers. Increasingly, though, the typical student who needs additional education looks nothing like Flounder, Babs or Bluto and wants nothing to do with a system they see as driven by liberal ideology and populated by drunken misfits more interested in toga parties than in preparing for the future. “The words are holding us back,” Busteed said. A new study from the Pew Research Center reinforces that. According to Pew, Democrats rank improving education as the second most important priority for the president and Congress, trailing only reducing health-care costs. Republicans, on the other hand, see defending against terrorist attacks, fixing social security and dealing with immigration as far more important than education or health care. Another divide shows up in the Pew survey, with about three-quarters of women and those between 18 and 49 years old saying that improving education should be the top priority. Men and older Americans see education as a less pressing issue. The Pew poll doesn’t distinguish K-12 from higher education, but it does point to the complicated relationship Americans have with education of all sorts today. And the way educators see education and the way the public sees education are vastly different. That perception applies not only to the public whose voices carry weight in state and federal funding of education but to the businesses and organizations that hire college graduates. A survey AAC&U conducted last year found that only 63% of business executives and hiring managers have a great deal or quite a lot of confidence in colleges and universities. That’s higher than the 45% of the public who express confidence in colleges and universities. And if you ask those same business leaders whether college is worth the time and expense, 85% to 88% say yes, according to the AAC&U survey. The responses indicate a clear ambivalence about higher education, though. Nearly all of the business leaders say they are asking employees to take on more responsibilities and more complex tasks than in the past. Nearly all of them say they are looking for prospective employees who think critically and communicate clearly, possess intellectual and interpersonal skills that will lead to innovative thinking, and have an ability to use a broader range of skills than workers in past years did. Many of them just aren’t convinced that college is preparing students for that. Many academics will scoff at the focus on business leaders. A university education isn’t the same as job training, they say. It isn’t about tailoring classes to meet the specific demands of the business world and molding students into corporate clones. I agree. And yet as the cost of college has risen precipitously, students increasingly want assurances that their degrees will lead to good jobs. We can – and should – talk about how our degrees will make students into better people and better citizens, about how our courses prepare students to face the unpredictable challenges of the future. Students want that, too. Above all, though, they want to be able to pay off their loans once they graduate. As Busteed told the AAC&U gathering, today’s students, as “consumers of higher education,” want more efficient and less expensive paths through college, and they want their coursework aligned with the jobs they will take upon graduation. So we are back to the balancing act that those of us inside colleges and universities face. We want our students to leave with disciplinary knowledge but must help them understand how our disciplines lead to careers. We fret over week-to-week understanding of course material even though much of it is very likely to be obsolete within a few years. We try to teach in a reasoned, meaningful, inclusive way even as a partisan, skeptical public questions our epistemological foundations. We carry the burden of a name – college or university – that has lost its cachet even as a wary and reluctant public continues to see a need for what we do. What’s the point of a major? A colleague at AAC&U pointed to an enormous paradox in teaching and learning today. As students flood into what they see as “safe” majors of business and engineering, the liberal arts and sciences have donned the mantle of job skills. English isn’t just about literature and poetry; it’s about the communication skills that employers prize. History isn’t just about an understanding of the past; it’s about critical thinking skills that will get you a job. Political science isn’t just about the machinations of government; it’s about learning to work in groups so you can thrive in a career. All of those things are true, but as my colleague reminded me, students don’t choose a major because they think it will make them better at group work, improve their critical analysis, or allow them to make better decisions independently. They choose a major because they are passionate about literature or linguistics or biology or politics or French or journalism or (name the major). So more than ever, we educators must approach our work in multiple layers. We must balance disciplinary depth with broad-scale career skills, short-term understanding with long-term viability. We must learn to explain our majors more meaningfully and our roles as academics more thoughtfully. We must help our students explore the many facets of our majors while helping them connect to the ideas and philosophies of other majors. We must guide students through the details of disciplinary competency while recognizing that only the broader skills and experiences – what the media historian Claude Cookman calls the “residue” of education – generally sticks with students over the years. Higher education has always been about exploration and understanding. As those of us who make up higher education balance the many demands pressing down on us today, though, we must undertake a broader exploration of just who we are because, increasingly, those on the outside don’t know. Those of us in higher education like to think of ourselves as preparing students for the future. That’s a lofty goal with a heavy burden. Predicting the future is a fool’s game, and yet as educators we have accepted that responsibility by offering degrees that we tell our students will have relevance for years to come. In our courses and with our colleagues, we simply don’t talk nearly enough about how we foresee the future and what role our disciplines will play. We have a responsibility to ask ourselves difficult questions: What skills will our students need not just next year, but in the next decade and the 40 or 50 years after that? What can we do to prepare students for a future we can’t possibly predict? Michael Murray, professor of physics, summarizes notes from a group discussion during a STEM sexual harassment prevention workshop. 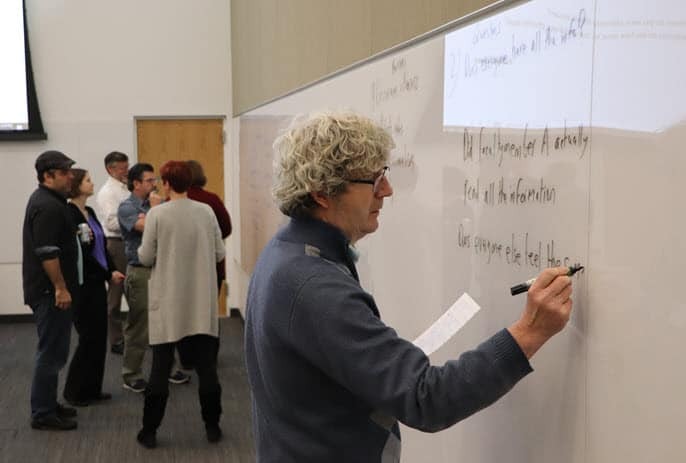 The workshop, held earlier this month, was sponsored by the Center for STEM Learning and led by Blair Schneider of KU and Meredith Hastings of Brown. Most certainly, college helps students learn about themselves, their peers and society, develop independence and responsibility, and gain enough disciplinary understanding to apply skills in a meaningful (if often rudimentary) way. There’s a danger in being too general, though, because those generalizations make academia an easy target for critics, who like to paint higher education as out of touch and irrelevant. In that view, all a person needs is hard work, ingenuity and grit, not a college degree. Drawing on those inner skills is not only practical but much, much cheaper. A variation on that theme posits that college students are ill-prepared for the jobs of today, let alone the jobs of tomorrow. You don’t have to look far to find scathing portrayals of universities as mindless playgrounds in which students dally for four (or five or six) years and emerge mired in debt and no more prepared to face the world than when they started college. Both of those portrayals hold grains of truth, but they also view education through the lens of neo-liberal utilitarianism. In that view, the only valuable skill is one that leads to monetary gain and the only valuable graduates are those that fit like cogs into predetermined slots of corporate machinery. A degree, in that view, is all about the money. The federal government has backed that perspective by promoting comparisons of graduates’ salaries vs. cost of degree, and universities have perpetuated it themselves as they have whittled away at the liberal arts, raised tuition to levels that stretch ordinary families to the limit, and run themselves like corporations rather than nonprofits that serve the public good. States and the federal government have forced universities to adopt that way of thinking as they have slashed spending on higher education and turned student loans into a guaranteed profit center for private lenders. It’s the beginning of the semester, though. Students and instructors have a chance to start anew. We can’t solve all the problems of higher education in a single semester, no more than we can teach students all the skills they need in a single class. We can and must keep the broader picture in mind, though, as we lead students into a new exploration of disciplinary challenges, societal problems, and academic inquiries. As we do, though, we must remember that knowledge is useless without an ability to apply it, and that skills have limited currency without an ability to refresh, revise and remake them. So as you begin the semester, consider this: What are you doing to prepare your students for the future? And how will they know they are on the right track? The Midwest is producing an increasingly larger share of graduates in technology-related fields, the website OZY reports. Twenty-five percent of computer science graduates now come from the Midwest, OZY writes, saying that “tomorrow’s innovators may never set foot in Silicon Valley.” … The Atlantic looks at the struggle that the University of Wisconsin at Stevens Point faces in maintaining liberal arts programs amid budget cuts and a declining number of majors. … Providing students more direction and community could help reverse declining enrollments in history programs, Jason Steinhauer of Villanova argues in a Time column. … Politico writes about how free college, an idea usually associated with liberal politics, has been enthusiastically embraced in conservative Tennessee. The end of a semester is always hectic, but it’s important to spend time reflecting on your classes while things are still fresh in your mind. Did students learn what you had hoped? If not, what do you need to change the next time you teach the class? What activities or assignments led to unexpected results or fell short of your expectations? What readings did students struggle with and how can you help students grasp them better? What discussion areas resulted in a mostly silent classroom? What elements of your syllabus did students find unclear and need revision? Those are just a few things to consider. Now is good time to make some notes because by the time you get to a chapter or assignment or module or discussion next time, you will struggle to remember exactly what changes you had planned to make. Ashley Herda, assistant professor of health, sport and exercise sciences, has found a great way to reflect on her teaching and to make sure she is ready the next time she teaches a class. She calls it a living syllabus. A SEMESTER’S WORTH OF LOST AND FOUND. Students leave behind a lot of things in the large lecture halls in Budig Hall each semester. 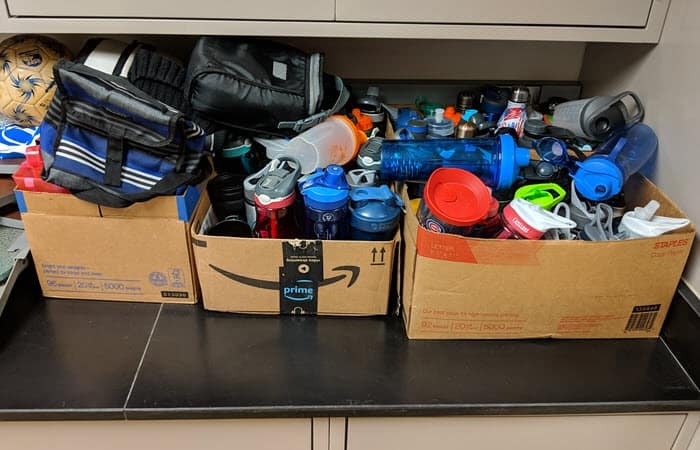 Water bottles and lunch bags are always plentiful, as are notebooks and books. It’s not unusual to see keys, flash drives, watches, glasses, shirts, student ID cards, passports and even credit cards. This is in addition to perhaps a dozen coats and jackets and even a stray soccer ball (upper left). Hmm. 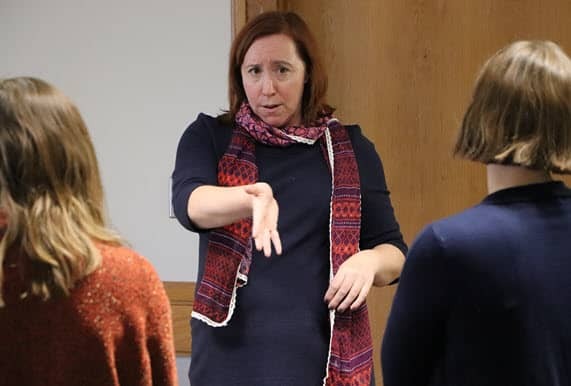 Herda explained her approach during a workshop at the Edwards Campus last week. She said the living syllabus worked like this: After she distributes the course syllabus to students, she sets aside a copy for herself and makes digital notes on it during the semester. If students find something unclear, she makes changes in the syllabus in edit trace immediately. If an assignment takes far less time than she expected, she highlights a section of the syllabus and makes notes in bubbles to the side. If there are problems in grading, she reminds herself right in the document. This approach makes it easy for her to make adjustments for a future class, she said. Rather than starting from scratch each time, she has the living syllabus ready to go. I love the idea of a living syllabus. The name perfectly captures the idea of a course in a state of constant improvement. It also turns the syllabus into a means of reflection, not just an artifact of a class. During the workshop, other instructors explained their own approaches to reflection and course improvement. John Bricklemyer, lecturer in engineering and project management, jots down notes after each module in the online classes he teaches and frequently shares his thoughts with other instructors. Lee Stuart, leadership programs manager on the Edwards Campus, includes a reflection component for each assignment that asks students for their feedback on the assignment. That helps him get a better sense of places where students are struggling or of assignments that might be too easy or that are not meaningful. Like others, I have long made notes about classes and assignments during the semester. I usually do this in a OneNote file where I keep a class outline, readings and notes. I also build in reflection assignments in each course I teach and ask students to evaluate themselves and the course. When I teach in person, I usually spend part of the last day of class talking with students about the strengths and weaknesses of the class. I’m candid about strong and weak areas I saw in the course and students are generally forthcoming with their own thoughts. The method of reflection on a course is less important than the act of reflecting, though. The disciplines we study and the courses we teach are dynamic and need continual oversight. Students change. Materials change. Our understanding of the subject matter changes. Needs of a department change. Imagine how vibrant teaching might be if all instructors embraced the philosophy of a living syllabus. It’s a worthy aspiration. A recent article from Innovation Excellence offered what it called the four rules of brainstorming. The idea of rules for something as freewheeling as brainstorming seems a bit odd, but I can see the logic in establishing some guidelines. Go for quantity over quality, because we know the best way to get good ideas is to just start with lots of ideas. Combine and improve upon ideas. Here’s another approach to using silence as a motivator for active learning. I’ve written previously about how Genelle Belmas uses classroom silence to help students get into a “flow state” of concentration, creativity, and thinking. Kathryn Rhine, as associate professor of anthropology, uses silence in as part of an activity that challenges students to think through class material and exchange ideas but without speaking for more than 30 minutes. Kathryn Rhine explains how she approaches a silent seminar in her anthropology classes. Rhine calls this approach a silent seminar, and she explained it during demonstrations at a meeting of CTE’s C21 Consortium earlier this month. The technique can be easily adapted for nearly any class and seems especially useful for helping students reflect on their learning at the end of the semester. She covers four tables with butcher block paper and moves them to the corners of the room. She creates four questions about class readings and assigns one to each table. She used this recently after students read Ann Fadiman’s book When the Spirit Catches You Fall Down. Three of the questions were based on core themes of the book. The fourth asked students to consider elements of the book that were less resolved than others. Each student receives a marker and is assigned to a group at one of the four tables. Students then consider the questions and write their responses on the butcher block paper. They have five to eight minutes to write before moving to another table. They add their responses to the questions at the new table but also respond to answers that other students have written down. As “silent seminar” suggests, this is all done without speaking. Once students have responded to all four questions, though, Rhine gives them permission to talk. And after 30 to 40 minutes of required silence, they are ready to discuss, she said. Working in their groups, students summarize the core themes of the comments on the tables, nominating one person from each group to present their summaries to the class. Participants at C21 write comments during a silent seminar demonstration. She also asks students to reflect on the approach used in the silent seminar. How was it different from a typical class and how did it change the way they participated? Rhine’s classes range from 10 to 30 students, but the silent seminar could be used in any size class. If a room doesn’t have tables, use whiteboards or attach paper to the walls and have students write in pen. Giant sticky notes would make this easy. I could see this working with digital whiteboards or discussion boards, as well. The key to the exercise, as with all active learning, is student engagement. Rhine has found the silent seminar particularly effective in that regard. She has also found the anonymity of the exercise helpful. Students are more likely to take intellectual risks when they don’t have the entire class watching them and listening, she said. The silent seminar also engages students in several different ways: critical thinking, writing, summarizing, and presenting. It has an added benefit for the instructor. “I love 40 minutes of silence where I can just rotate around and not have to be on the whole time,” Rhine said. JSTOR Labs, the innovation arm of the academic database JSTOR, has released a new tool that allows researchers to find book chapters or journal articles that have cited specific passages from a primary document. The tool, called Understanding Great Works, is limited to material in the JSTOR database. It is also limited to just a few primary sources: Shakespeare’s plays, the King James Bible and 10 works of British literature. It works like this: You open a primary text on the JSTOR site. A list along the right side of the digital document shows how many articles or books have quoted a particular passage. Clicking on the number opens a pop-up box with the sources and a passage showing how the line was used in a particular article or book chapter. Understanding Great Works expands on project called Understanding Shakespeare, which was released in 2015, and JSTOR Labs is asking for input on what primary texts should be added next. (Oscar Wilde’s play “The Importance of Being Earnest” had the most votes as of Thursday.) I learned about it from a post on beSpacific. JSTOR Labs has been releasing a new digital tool about once a year. A tool called Text Analyzer, which was released last year, is worth checking out. It allows you to upload a document for analysis by JSTOR, which then offers suggestions for sources in the JSTOR database. It works not only with Word documents and PDFs but with PowerPoint, spreadsheets and even photos of documents. UNICORN FOR A DAY. Yes, that was a unicorn sitting in Prajna Dhar’s engineering class earlier this semester. Actually, it was Kevin Beneda, who had lost a football bet to a friend, wearing a unicorn head. 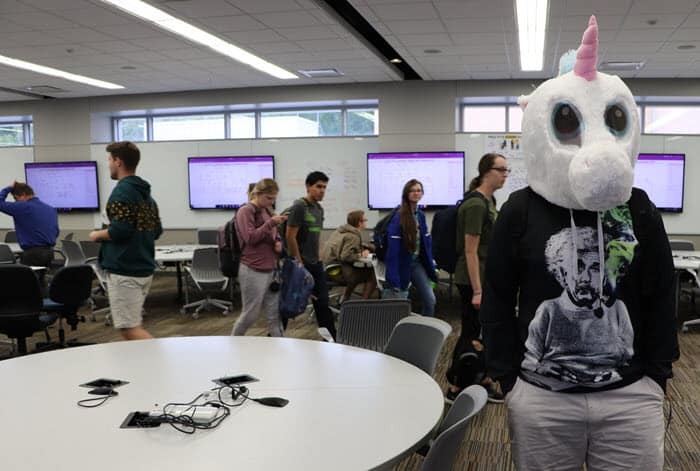 To pay off the bet, he transformed into a student unicorn in all his classes that day. No one seemed to mind, at least in the class I visited. Strong beliefs about volatile issues can quickly turn class discussions tumultuous, especially during election season. Rather than avoid those discussions, though, instructors should help students learn to work through them civilly and respectfully. That can be intimidating, especially in classes that don’t usually address volatile issues. Jennifer Ng, director of academic inclusion and associate professor of educational leadership and policy studies, says transparency is the best way to proceed with those types of discussions. Be up front with students about how emotionally charged issues can be, she told participants at a CTE workshop on Friday. Explain what you are doing and why, but also be clear that you don’t know exactly where the conversation might go. 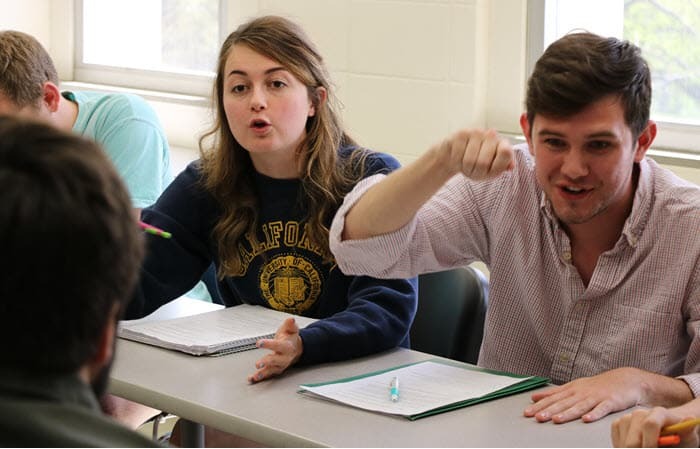 Students in Political Science 678 debate foreign policy issues in class. The instructor, John Kennedy, helps students ground their discussions in facts. The CTE website offers advice on how to handle difficult discussions, KU Libraries lists many resources for helping students with media literacy, and Student Affairs lists resources where students, faculty and staff can turn for help in working through personal and professional issues. Focus on facts. Politics has become increasingly polarized, making it easy for discussions to turn into heated rants. So help students focus on the facts of an issue or position. What do we know and how do we know it? What has scholarship suggested? Yes, the word “facts” has itself become problematic in a political atmosphere where partisans dismiss anything they don’t like and instead embrace “alternative facts.” Helping students identify what the facts are can help keep discussions away from personal attacks. Challenge the position, not the person. That, of course, is an approach educators have advocated for years. If we hope to have civil discussions, we have to help students pick apart arguments rather than alienate people they disagree with. Ask students to imagine an objective approach. Rather than taking a partisan side, ask students to step back and look at arguments from a neutral perspective. What are the strengths and weaknesses of each side? Ng describes this as having students look at the world in a ”meta” sort of way, one that moves them out of the fray and into a broader perspective. Have students take an opposite view from their own. This is similar to the neutral viewpoint in that it forces students to step back from strongly held positions and consider why others might disagree. Have them write a paragraph explaining that other perspective so they can think through it more meaningfully. Another approach is to have students look at the issues from the perspective of an international student. Have students create ground rules for discussions. This helps them feel invested in a conversation and reminds them of the importance of respectful discussions. Have a “pause button.” This is a signal that any student can use to indicate that discussions are becoming too heated and need to stop, at least briefly. The pause can help everyone regroup so the conversation can remain civil. Give students permission to check out of a conversation. Some instructors allow students to pick up their phones and block out a discussion if it gets too intense. This can also signal to an instructor that the conversation might need to pause. Some instructors allow students to leave the room if things get too heated, but that also draws attention to students who leave. Don’t assume you have to know what to say. If something comes up that you aren’t prepared to deal with, explain to students that you need to do some research and will get back to them by email or during the next class. Sometimes, instructors just need to listen and try to understand rather than wading into a subject unprepared. Have students do some writing before they leave class. This can help ease tension, but it also gives instructors a sense of what students are thinking and what they might need to address in a later class. Take care of yourself. Instructors who deal with emotional classroom issues and listen to students’ personal challenges can suffer what the American Counseling Association calls vicarious trauma or compassion fatigue. This is tension brought on by dwelling on stories of traumatic experiences that others have shared. A recent article in Faculty Focus offers suggestions for dealing with these types of issues. Forthcoming webinars led by the university’s Technology Instruction and Engagement team will focus on using MediaHub and the Blackboard grade center. You will find a full list of workshops on this site. Past webinars are available on KU IT’s YouTube channel, and the team’s resource page, How to KU, offers help on Office 365, Sharepoint, and several Adobe applications. … The Library of Congress has created what it calls the National Screening Room, an archive of films that can be downloaded or watched online. … Edutopia offers strategies for remembering students’ names. … Wichita State’s Campus of Applied Sciences and Technology will pay provide a free education, relocation expenses for incoming students who live more than 75 miles away, and housing and cost-of-living stipends, according to Education Dive. The program, which is funded by the Wichita Community Foundation, is intended to address a shortage of skilled workers in aviation fields like sheet metal assembly and process mechanic painting. Students are guaranteed jobs after they graduate. From the trenches, the work to improve college teaching seems interminably slow. Those of us at research universities devote time to our students at our own peril as colleagues who shrug off teaching and service in favor of research earn praise and promotion. When we point out deep flaws in a lecture-oriented system that promotes passive, shallow learning, we are too often told that such a system is the only way to educate large numbers of students. We seemingly write the same committee reports over and over, arguing that college teaching must move to a student-centered model; that a system established for educating a 19th-century industrial workforce must adapt to the needs of 21st-century students; that higher education’s rewards system must value teaching, learning, and service – not just research. 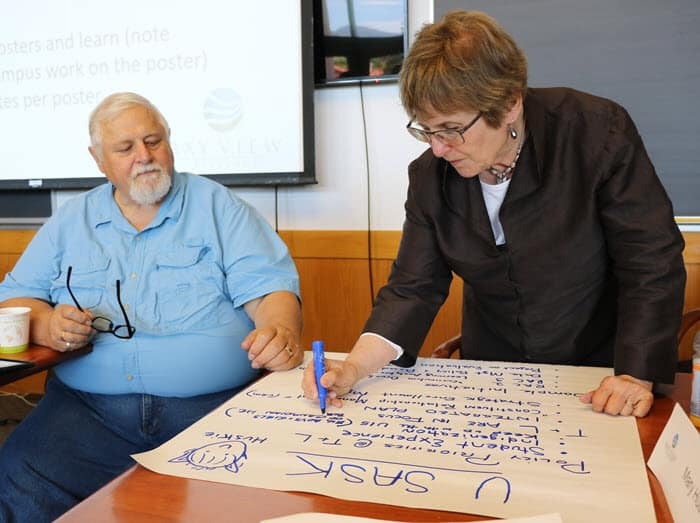 Mary Huber works with Jim Greer, an administrator at the University of Saskatchewan, during a meeting of the Bay View Alliance. In the end, few people seem to be listening. That’s my perception, at least. During my 15 years as a faculty member, I have seen many positive changes as the benefits of active and engaged learning have seeped into broader conversation and as the need to reform higher education has become part of a growing number of conversations. The largest barriers to change seem immovable, though – especially as we push against them day by day. It’s easy to get discouraged. So when I heard Mary Huber speak about dramatic changes she had seen in teaching and learning over the last three decades, I wanted to hear more. That was in January 2017 at the annual meeting of the Association of American Colleges and Universities. I finally had that opportunity a few months later at a meeting of the Bay View Alliance, a consortium of research universities working to improve teaching and leadership in higher education. I was hoping not only to get a broader perspective on higher education but to gain some reassurance that the work we do to improve undergraduate education matters. I wasn’t disappointed. I never am when I speak to Mary, who has played a crucial role in shaping discussions about teaching and learning over the past 30 years. I have gotten to know her over the past few years through our work in the BVA. She was a founding member of the organization and is now a senior scholar and a member of its leadership team. The insights and leadership she brings to the BVA were honed over many years of work at the Carnegie Foundation for the Advancement of Teaching, among other organizations. At Carnegie, she helped lay the foundation for a movement for better teaching that has blossomed over the last decade. As an anthropologist, she has studied colleges and universities as cultural institutions, offering insights into how they work and why they do what they do. She oversaw Carnegie’s role in the U.S. Professors of the Year Program for many years, directed the Cultures of Teaching and Learning Project and the Integrative Learning Project at Carnegie, and served on the leadership team of the Carnegie Academy for the Scholars. These projects led to books in 2002, 2004, 2005, and 2011. At Carnegie, Mary Huber was among the “we” that Ernest L. Boyer refers to in the recommendations in an influential 1990 report, Scholarship Reconsidered. That publication took higher education to task for diminishing undergraduate teaching through a rewards structure skewed toward narrowly defined research. She was a co-author of a follow-up book, Scholarship Assessed: Evaluation of the Professorate, and was an early advocate for the scholarship of teaching and learning (SoTL). She has continued to publish works about SoTL and present conference papers on improving teaching and learning. She also serves as a contributing editor to Change magazine. Mary covered a lot of territory during a 30-minute conversation on a shady balcony during a mild summer day in Boulder, Colo. She spoke about such things as the rise of pedagogical scholarship within disciplines; the way that education scholarship in the United States developed separately from a line of inquiry followed in the U.K., Canada, and Australia; and the role that teaching centers have played in promoting engaged learning. “There’s much more conversation today, more places for that conversation, more resources out there that have burgeoned, really, in the past 20 to 25 years,” she said. She also spoke of faculty members and administrators in terms of the learning they must do about teaching and learning and “remember what it’s like to be a novice in this area” like our students. She didn’t downplay the challenges, though. In fact, at the end of our interview, she made it clear that those challenges were enormous. To understand how we go to that point, though, we have to go back to the 1960s, when Mary Huber completed her undergraduate work at Bucknell University. It’s from that starting point that she explains the changing landscape of teaching and learning through the late 20th and early 21st centuries. Mary Huber: My first exposure to teaching in higher education was at a liberal arts college in central Pennsylvania, Bucknell University, a fine liberal arts college. That was in the mid-1960s. So that’s my baseline. From there, I went on to experience with graduate schools, first with my former husband’s and then with my own. After that I began work as a researcher and writer on higher education, first as a research assistant in economics and public policy at Princeton University and then through my roles at the Carnegie Foundation. So it’s kind of been an unbroken chain of some exposure to teaching and learning in higher education at different kinds of institutions. I think that higher education itself began to change as the proportion of students going on to college changed. That was something that began after World War II, but really took off in the mid to late ’60s. And it brought to colleges and universities a lot of people who weren’t prepared in the traditional sense, at the level that high schools used to prepare college-bound students. There were people going to college who might not have gone in earlier years. That was partly made possible by the growth of community colleges at that time, but many four-year colleges had also opened their doors and brought in new students. This influx of new students created pockets of pedagogical innovation in the university. I’m thinking in particular about some of the new fields that emerged during that period like composition. Not that composition hadn’t been around, but as a separate field with an identity of its own, it started in the late ’60s and early ’70s, dealing with this issue of students who weren’t prepared for college writing. Composition scholars have persisted in doing excellent work on teaching and learning, with many thoughtful, committed people working to understand and address the problems student writers face in academic writing tasks. There were some other new fields that took off around that time, like ethnic studies and women’s studies, which had a pedagogical twist to their mission. Concerned about how traditional power structures were re-enacted in the classroom, scholars in these fields were trying to create more democratic classrooms that empowered students to move beyond all that. So there were several pockets where there was some very interesting pedagogical thinking going on. But small groups of people were becoming pedagogically restless in some of the older and larger fields as well. Math was certainly a case in point, spurred by the math wars in the K-12 arena, by the arrival of calculators, and (of course) by high rates of attrition in developmental and advanced introductory mathematics classes. So there were things happening here and there, but it was in pockets. And at some point it spread out. There’s a very interesting article on changes in STEM education policy from roughly the mid-1980s to the late 1990s by Elaine Seymour, who led a center for ethnography and evaluation research right here at the University of Colorado. Her history began with concerns about the pipeline for STEM careers. There weren’t enough people graduating and continuing on in STEM careers, especially not enough women or underrepresented minorities who were coming in and persisting in STEM. That spurred government agencies to support research to explore why that would be. And there was some finger-pointing at pedagogy. But it wasn’t just finger-pointing. It was based on research that was being done at the time on people who did leave STEM to go elsewhere in the university. That, I think, has been another continuing stream of attention to teaching and learning, but not so walled off from other parts of the university. STEM was a large and a growing area in higher education and there was money for research on pedagogical and curricular issues that involved people in mainstream disciplines and institutions making that part of their work. Indeed, by the 2000s, well-known research leaders, like Nobel-prize winning physicist Carl Wieman were lending their prestige and their intelligence and their networks to initiatives to improve STEM teaching in higher education. Doug Ward: So here we’re talking about the ’90s? 2000s? MH: Getting into the ’90s and ’00s. But certainly concern about pedagogical and curricular issues in STEM education predated that, going all the way back to Sputnik in the 1960s. DW: So this surprises me because it sounds like many of the same conversations we are having today: that there’s a concern and certainly a lot of effort over the last 10 years. Why has it been so hard to get some of the changes through to help our students? MH: Well let me back up just a little to say that I actually think there have been many changes in teaching and learning over the past several decades. Some of them grew out of changes in our fields themselves – especially some of the goals, the way people thought about what they wanted for undergraduates. My field is anthropology and I think anthropology, like many others, has had thinkers who had pedagogical interests, and departments that wanted students to begin to experience what it was like to produce knowledge as professionals do in the field. This was also the case, I think, in history. Yes it’s true that not everybody jumped on board for that. But nonetheless there has been a growing sense that there is just too much knowledge out there now, too much information, too easy to access in this period with the internet and the Word Wide Web. So that was another push that maybe we should be doing something else with undergraduate education than just focusing on mastering content. That’s another thread to add to pipeline and equity concerns. And I think there have been many others – for instance, attention to service and community engagement, not to mention gaining mastery over the new technological tools of the academic trade. Indeed, if you trace them all out, I think, the picture that emerges is the growth of something that Pat Hutchings and I have called a teaching commons. There’s much more conversation, more places for that conversation today, more resources out there that have burgeoned, really, in the past 20 to 25 years. Disciplinary societies have developed new journals or beefed up old ones about teaching in their fields. There are panels on teaching and learning and curriculum now at meetings that didn’t used to be there. For a long time, it really was a kind of an invisible ground. The traditional forms of teaching – we’ve all experienced them, at Bucknell or wherever we went – but then that’s what shifted. DW: That’s interesting. The way you’re describing it is that there were a lot of private conversations about teaching but really not the public places to have those discussions or the resources to disseminate information. MH: That’s right. Or to make it part of your life as a teacher. There’s a lovely book by the scholar Wayne Booth. He was a literary critic and scholar of rhetoric at the University of Chicago. He has a wonderful book called The Vocation of a Teacher, published in 1988, which was a collection of his essays and speeches on educational themes. And the resources he cites on how he himself learned to teach are from another era. Not the citations and references you’d expect to find today. There was a footnote listing books that “teach about teaching by force of example” and citing “an obscure little pamphlet” about discussion teaching, but mostly, he said, he learned about teaching through staff meetings and conversations with colleagues. ..There was very little in terms of a formal apparatus of research, or of major thought leaders in teaching and learning. It was very sporadic. I wrote about that back in 1998 or ’99 in an essay on disciplinary styles in the scholarship of teaching. That’s when I was getting into this myself and realizing that there was much more going on than I thought. And I used Wayne Booth’s book an example of the thin web of scholarship on teaching and learning that was common before. Of course, there were thoughtful people who were wise about these things and had given it enough thought to write about it, but they didn’t have much to back it up. DW: I’m going to veer a little bit because this sort of ties in with an article that you’ve been working on about what is known about teaching for liberal learning. We talked before our interview about how different strands in the scholarship of teaching and learning evolved. Essentially, in the 1970s and 1980s, the British were saying we have a theoretical grounding to our efforts to improve teaching and learning and you Americans don’t. It’s interesting how this kind of practitioner research started to form. How are you seeing the differences? MH: It is interesting. The way I see it – I’m sure there are others whose standpoint is different – the U.S. never had a very robust area of scholarly research on learning and teaching in higher education. A lot of our focus in our graduate schools of education was on K-12. MH: For some reason that was not true in the U.K. and Europe. One particularly strong line of work on students’ approaches to and experience of learning was really jump-started by a Swedish research team in the mid 1970’s. That’s when they published their initial papers, presenting work on the experience of learning that was then picked up by colleagues in the U.K., Australia, and Canada. Of course you can trace this theme back a long way. But in the U.S. we didn’t have that strong or coherent an education research group. There have always been a few involved in studies of teaching and learning in higher education, but their work didn’t really shape or constrain what was going on as other groups became interested. This led to a rather diverse set of communities and literatures. The field of learning sciences wasn’t really focused on higher ed, but what they were discovering about memory, prior knowledge and other kinds of things were presented as universally applicable. That was one stream. The professional development people took some of that literature and tried to put it into a frame that would be accessible and helpful to teachers in higher education. And then you had this emergence of the scholarship of teaching and learning, which was a practitioner’s form of research and inquiry into teaching practice. And that was followed by the emergence DBER, which stands for disciplinary-based education research. This involved people in disciplinary fields like chemistry education research and physics education research who had higher education as the domain in which they were examining the ins and outs of STEM learning and teaching. So you have these many different streams. And over recent years, there have been more and more occasions where people coming from one or the other of those communities can have access to and become aware of what’s going on in the others. For example, longstanding journals like Teaching Sociology or Teaching of Psychology, have been raising the bar on what counts as quality in writing about teaching and learning. It’s no longer enough to tell readers about your clever idea for teaching this topic or that one. We really need to be looking at how students are responding to this kind of pedagogy. So those journals upped the ante for what they would be willing to publish. Other journals in other fields have been more recently founded, and there are now several online journals for the scholarship of teaching and learning itself. 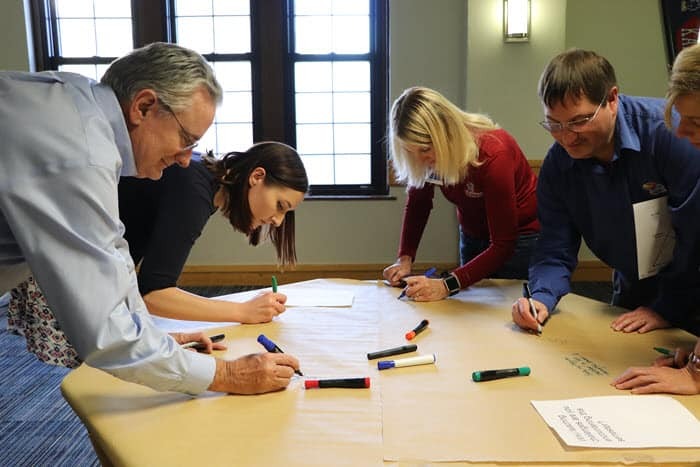 More campuses, too, now have centers for teaching and learning that have been sponsoring faculty learning communities and improvement initiatives around issues of teaching and learning that bring people together from across the campus. All these developments have helped widen and deepen the teaching commons, as we have more occasions and more reasons to meet each other and learn about each other’s work. DW: So I’m visualizing a lot of threads that have been coming together, and the way you’re describing it is that we have shifted from an anecdotal approach to a scholarly approach where there is some substance; there is some foundation. But then where does the criticism from the British fit in? MH: They had, and continue to have, a relatively small community of researchers who have been building on each other’s work for 30 to 40 years, exploring students’ approaches to learning, among other themes. That’s where these ideas of deep, surface, and strategic approaches to study emerged. They have looked at how that plays out in the lecture format, in the Oxbridge tutorial, in the seminar – indeed, they’ve gone far beyond just that simple trichotomy, and have created a body of knowledge that is often regarded as foundational for new faculty in the U.K. to learn about, or for scholars of teaching and learning there to reference in designing their own inquiries. In 2008 a group of researchers from the Higher Education Academy at Oxford did a review of the literature on the student learning experience in higher education. You can see that it’s a body of literature that has depth and subtlety and people who are in communication with each other over the years, and that it’s benefited from a long history of exchange between researchers in Australia, Canada, and the U.K. They are a group of people whose careers shift continents and who stay in touch. That is very different from what we have. Very different. So when the scholarship of teaching and learning caught on in the U.S. among people who are primarily teachers and researchers in their own disciplines – historians, mathematicians, whatever you have – it was both limited and empowered by the relative absence of a thriving local community of researchers in higher education pedagogy. As the scholarship of teaching and learning developed in the part of the world I was working from, at the Carnegie Foundation, we basically urged newcomers: ‘Come on. Draw on whatever you can. You don’t have to master the field of educational psychology or statistics or 40 years of research on this or that educational theme in order to be observant and reflective about what’s happening in your classrooms with your students. If you want to draw on Husserl or Heidegger, be my guest. There are many different ways in which insights from across the academic spectrum can inform your work.’ And I’m very glad. Some of us who were organizing this movement in the U.S. soon learned that your “typical” professor of Chaucer and medieval English literature may not have the time or the interest to tap a whole new (to them) area of study, although they certainly would be interested in addressing questions about their students’ learning. I myself, coming from the humanistic side of anthropology, had trouble with the literature in educational psychology and professional development. I wasn’t interested in it at first. I wasn’t sure about the epistemological grounds on which it was done. I didn’t have the expertise to read it with understanding. But that didn’t mean I wasn’t interested in student learning and couldn’t bring to it some thoughts and methods from my own field. Still, once people like me or that Chaucerian scholar come together around questions of learning with people from a variety of other fields, we soon expand our range of reference, and get better at accessing even the literature in education without being intimidated or offput. DW: I want to ask one more thing. What do you see as the biggest challenges right now in terms of teaching and learning? MH: Well, I really would go along with the Bay View Alliance on that. I still think that building a stronger, more sophisticated conversation about teaching and learning in departments and disciplines and institutions – building stronger cultures of teaching and learning makes this a better conversation, one people are prepared to engage in more readily – is the challenge that we are facing now. I’m less worried about professional development in the formal sense. I think that centers for teaching and learning have a big role to play. I think we would make much more progress with this if there were more opportunity in people’s regular, everyday lives as faculty to talk about teaching and learning and to have their contributions recognized. And I think that will happen. I do think there’s been change in the right direction, but there’s a long way to go in many departments before the conversation goes beyond just a one small group of enthusiasts or perhaps the faculty appointed to the curriculum committee. I think the work of those committees focused on undergraduate education need to be upheld as more central to the work of our institutions and not just shoved off to one side. However, we need to remember, just like we do for our students, what it’s like for a faculty member to be a novice in this pedagogical conversation. But if we keep working on this and have more occasions for graduate students and faculty to talk about teaching and learning, and more department chairs who see this as important and include it in faculty meetings, that will help. Indeed, you could list a whole number of ways in which to make more about our teaching lives public and raise pedagogical literacy to a higher level. DW: I did a presentation a few weeks ago about the need for elevating teaching in a research university. And the response I got from faculty was, “Yes, but … how do you do that? Because we’re a research university.” This is what we get a lot. “We’re a research university. We don’t have time to carve out for something else.” How do you respond to that? MH: That is partly why we need leaders who keep reminding us that we’re there for an educational mission – for both undergraduates and graduate students, especially when you are talking about a research university. I think we need our faculty evaluation systems to make a larger space for teaching and educational leadership. But I don’t discount the difficulties given the way the larger political economy of higher education has developed and the competitive world in which institutions believe they live. DW: And that was the theme at AAC&U, this conflict between prestige and learning, that if we are aiming everything toward prestige, that doesn’t fit with this culture of how do we learn from our mistakes, how do we help all students learn more. That’s a big challenge. MH: It is a challenge. I was struck yesterday (at the Bay View Alliance Meeting) when Howard Gobstein (of the Association of Public and Land Grant Universities) said that we are going so slow and that society is changing so fast and we aren’t keeping up, that this is urgent. And I’m saying to myself fine, if it’s that urgent why has society pulled away from supporting our public institutions? I think that’s part of the problem. I don’t think we need to take this on ourselves entirely, the critique that we are just not doing enough. DW: That’s partly what we talked about. We need to be more of an advocate. MH: We need to be advocating. We need higher education leaders who can make a better case for public support for higher education. We need less talk about and less focus on austerity. I was reading a book recently on public universities – Christopher Newfield’s The Great Mistake. At one University of California institution, in the English major, Newfield said, there was only room for students to have “exactly one” small seminar class because they just don’t have enough faculty to offer more. If the need for our work as educators is as urgent as people think, then we need to more generously resource that effort. Obviously we can be smarter in how we work and improve and do better. And we are going to run into that prestige competition as a countervailing force. That’s how we live. But I don’t think it’s fair to just say that colleges and universities are failing. I think society is failing. If they need higher education to do something different, which I think they do, we cannot any longer settle for the kind of education that we have been providing to most of our students. Those good jobs in the workforce and the life they supported are no longer viable for a growing number of college graduates. We need to do better by the students. But we aren’t going to be able to do that without broader social support. Faculty will need time, security, resources, and encouragement to improve teaching and learning and educational programs so that our colleges and universities can serve today’s students well. That’s my view. This article also appears on the website of the Bay View Alliance.